Buying a rig is a highly personalised process and what is right for one person may not be right for another. This post is intended to provide basic advice to help you avoid common mistakes, provide links to further reading, and encourage you to seek proper advice from an instructor. If you take just one thing from this page, let it be: seek as much advice as possible from the instructors and coaches at your Dropzone. You can find a lot of information online, but only somebody who has seen you jump and had a face-to-face discussion with you can give the advice you need to make the right choice. If you’re not sure who to ask, the Chief Instructor at your dropzone will be the best person to either help you or point you to someone who can. At the early stages of your progression, renting is likely to be a good option for you. You are likely to be progressing through different canopies and you will want the opportunity to try different kit to see what features and characteristics you like, and the hassle of buying and selling gear frequently would be quite a headache! From a financial viewpoint, if you are doing fewer than 30 - 40 jumps per year it may actually be cheaper to pay £10 - £20 per jump for kit hire from your DZ than to own your own rig as the cost of depreciation and maintenance could be higher than the rental fees! Once you have tried out a range of options and you are jumping frequently, you may want to consider buying a rig. The information hereafter should provide you with a starting point for this process. There are many options available for each of these parts, and there is a lot of scope for mixing and matching from different manufacturers. Compatibility is very good, with most container systems built to accommodate common AADs as standard. Canopy compatibility generally just comes down to sizing, and each container manufacturer offers guidelines in this area. There are 3 main criteria to look for in a container: the harness size, container (canopy) size, and features. Almost all containers are made to measure the original purchaser, so you’re looking for something that was made to measure someone of a similar size to you. For the original specifications, there may be 5-10 different measurements given, but generally on the second hand market they are listed by just height and weight. While these usually provide a good basis for sizing, it’s always best to try the container on if possible (preferably with both canopies packed). 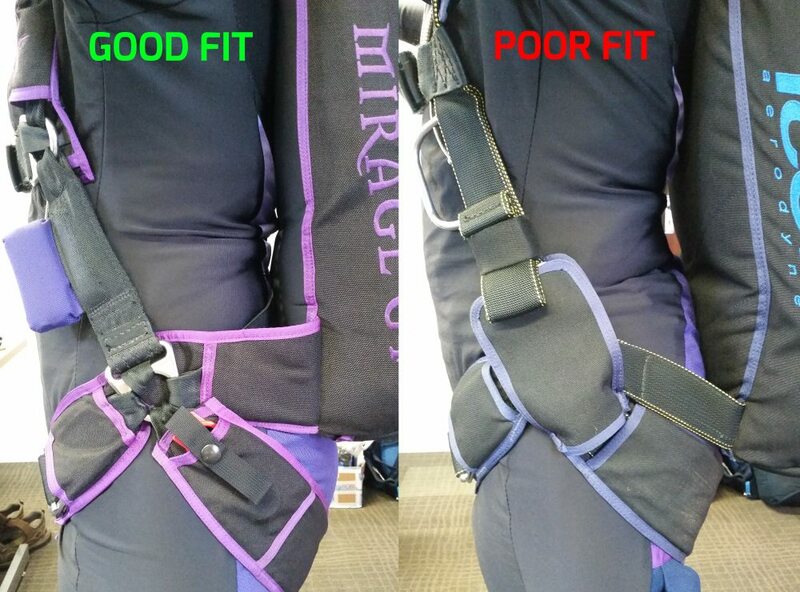 Look for the rig to be snug whilst still comfortable and see how well the hip rings and laterals align with your hips. As always, advice from an experienced jumper, instructor, or rigger is best. 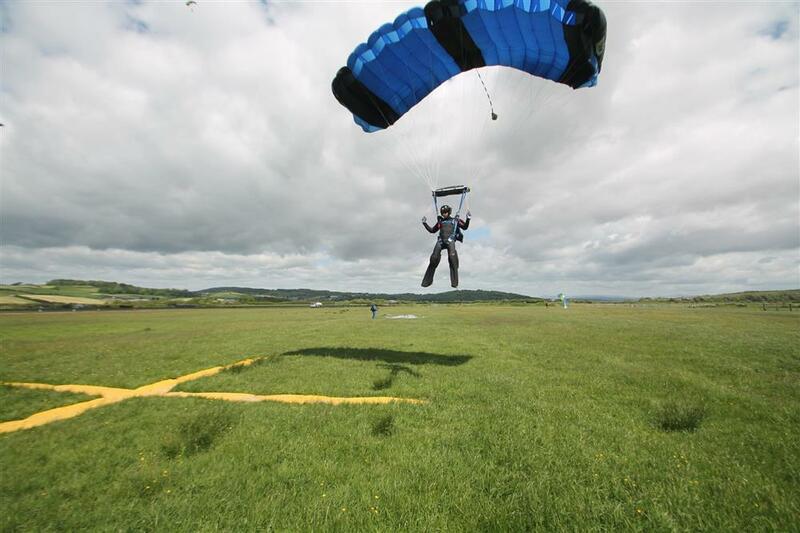 The canopy size you choose for your container should be based on the advice of your instructor or canopy handling coach and something similar to sizes you are currently jumping. Don’t be tempted to buy something smaller so that it will last you longer! Although paying for kit hire can be frustrating, it may be the best value option for you early on in your jumping career. You’re likely to be progressing through canopy sizes a little faster than you will later on so you would end up spending more to replace components regularly. Worse would be downsizing too quickly onto your own rig, only to injure yourself and not be able to jump at all! You should also make sure that your main and reserve are a similar size. A common mistake is to buy a reserve smaller than your main so that your container will accommodate a smaller main later on. Whilst this makes economic sense, it’s not likely to be a wise decision for safety. If you’re not comfortable jumping a 150 main, are you going to be ok jumping a 150 reserve when you’re in a high stress situation (after a malfunction), likely to be at a lower altitude under canopy, potentially landing off the dropzone, and on a canopy you’ve never flown? Thankfully, there are now several models of low pack volume reserve canopies available that allow the best of both worlds. These pack smaller so you can get a container/reserve combination which accommodates downsizing without compromising on your reserve canopy size. There are a vast array of options available on containers, often with varying names for similar features, so speak to your instructor, rigger, or dealer for detailed information, or follow the link above for a basic overview of what's available. In particular, if you are looking at used containers or rigs, pay attention to whether it has an RSL as this is a requirement for BPA A licence jumpers and is generally recommended for most new jumpers. Main canopies come in all shapes and sizes. The big point on which to focus is that it’s not all about size (and they all get measured differently anyway). The design of the canopy is just as important to how suitable it is for you as the size. Given the vast array of canopies available, it’s very important to seek advice from a coach or instructor on your choice of main canopy before you buy anything. Try to avoid getting advice or opinions from your peers on main canopies as their reference points will be limited and different to yours (something that feels slow to one person may be far too fast for another). It's best to try and test jump the type of canopy (and preferably the exact canopy type and size) before you buy it. Reserve canopy choice factors are fewer; they generally all cost a similar amount and they are all designed to be as reliable and docile as possible. As reserves are jumped less often than mains, there are fewer people who will have first-hand experience/advice to give you, but online reviews can be quite useful to weed out any poorly performing models. Almost all modern reserves are 7 cell, although you may come across some older 5 cell models. In general, fewer cells and a lower aspect ratio is supposed to result in a more docile canopy at the expense of “flare power”, so if you buy one of these models (after checking reviews) make sure you’ve got a good PLF! The newest options, like the Performance Designs Optimum use special low pack volume material which as a rule of thumb will pack around 1 size smaller than another reserve of that size. Reserves are generally expected to last around 20 years and depreciate fairly linearly, so aren’t a bad choice to buy new if you’re struggling to find the right one on the second hand market. 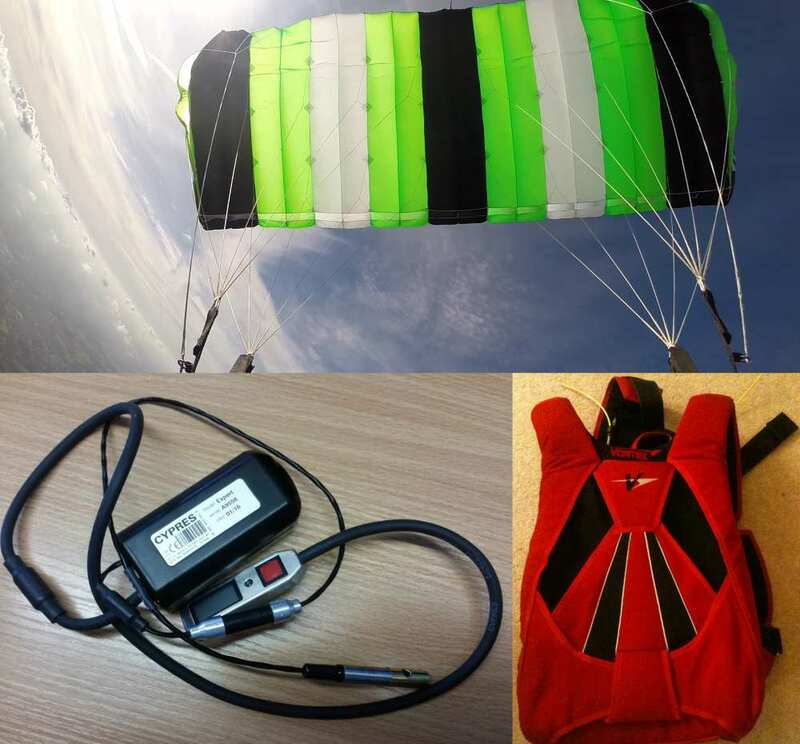 An Automatic Activation Device (AAD) is now a requirement for all BPA “A Licence” jumpers jumping in the UK, and many dropzones are now enforcing AADs to be mandatory for all jumpers. The 2 most popular modern brands of AAD are the Cypres 2 and the Vigil II+, both retail for just under £1000. The Cypres 2 has a fixed lifespan of 12 years respectively, while the Vigil II/II+ has an estimated lifespan of 20 years but may last longer or less time (with a 2 year warranty). Both units require maintenance under certain conditions over their lifespan. Other choices, such as the Mars, are becoming more common in the civilian market after being jumped by the military for some time and could be another option. There is a high demand for second hand units for people who don’t wish to shell out for a new one and as such you are likely to pay a small premium (above its value based on linear depreciation) to buy used. Buying new will work out to be the best value long term, but for those unable to afford the initial outlay renting is also an option. The prices from US-based retailers tend to look very appealing next to some prices from UK-based retailers. The main differences in the price are from the additional shipping costs, the VAT (20%) and Import Tax (2.7%) that is charged when importing goods to the UK. If you order from a US dealer and get it sent to the UK then you will have to pay these charges to HMRC before it is delivered, usually with additional handling fees from the courier. Whilst some people may try to avoid these fees by travelling to the US and bringing the equipment back in their luggage, this is considered tax evasion and is illegal. If caught you may face a fine or even imprisonment, on top of being charged the VAT and Import Tax as normal. Whilst the UK remains part of the EU and the single market, the price you see from an EU retailer is the price you pay; much like buying in the UK. If and when the UK leaves the single market this is likely to change; however, it is not currently clear exactly what our relationship with the EU market will look like. There are advantages and disadvantages to buying new gear or used gear and it’s good to consider both when looking for a rig. Often the best solution for you might involve buying some parts new and some parts used, so be prepared to look for parts separately if you can’t find a complete system that suits you. You choose the colours - because we all know how important it is to look good! A good solution can often be to look for second hand parts to begin with, and to buy anything you can’t find after a given period of time new. If you do decide to buy new there are several retailers available in the UK. At XDream Ltd, we are committed to providing you with the best service and the best prices we possibly can on new or used rigs. 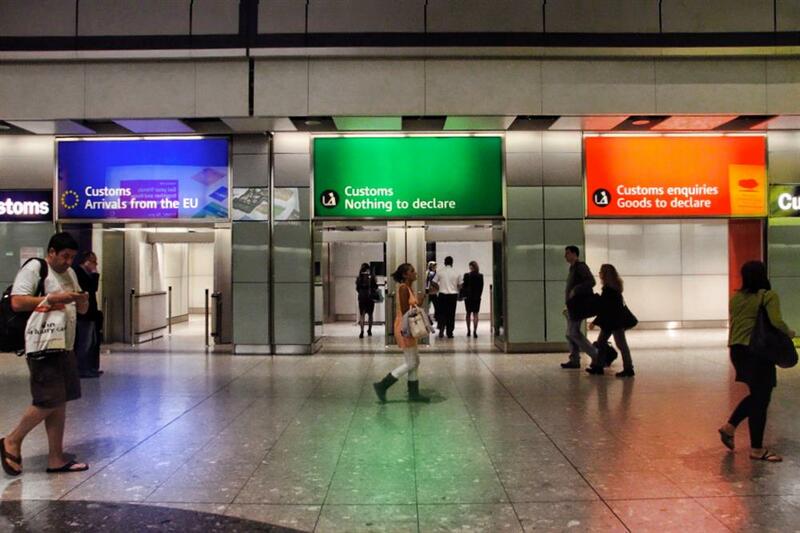 No hidden costs, no catches in the small print.